1. Put the vinegar in a medium saucepan with the shallots, sugar, ginger, cinnamon and salt. Bring to a boil and simmer for 5 minutes. 2. Add the cranberries and simmer gently, stirring often, for 15 minutes or so, until the consistency of a loose jam. Season with pepper, tip into a warm sterilised jar and seal with a lid, then leave to cool. 3. 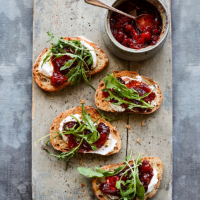 Spread the cheese roughly onto the pieces of toast and blob some of the cranberry chutney on top. Scatter a few rocket leaves over each and trickle a little olive oil over the top, if liked.